Marks and spencer summer dress size 8. Condition is Used. Dispatched with Royal Mail 1st Class. Excellent used condition with no visible defects. Recently purchased on eBay unfortunately it is too big. Very comfortable stretchy fabric, it has two side pockets and tapers towards the knee. Any questions please ask. Thanks for looking. This Very Stunning MARKS & SPENCERS Dress Is In Great Condition. Dress Length From Shoulder To Hem Is 45". This Very Stunning MARKS & SPENCERS Dre ss Is In Great Condition. Dress Length From Shoulder To Hem Is 37". Ex M& S Summer Dress Size 18 Lime. Labels were removed when I bought the dress .bust 42” hips 46” length from shoulder to hem is 37 “ Fully lined side zip excellent condition, embroidery anglaise pattern . 100% cotton. Marks and spencer red summer shift dress size 8 BNWT. Condition is New with tags. Dispatched with Royal Mail 2nd Class. Beautiful simple stylish dress that is fully lined and very vibrant in colour, great to hide any lumps and bumps you don't want to show. Having a clear out, any questions please ask. Thanks for looking. Square neckline, wide sleeves, back neck button and split. matching belt. GREAT QUALITY. MARKS & SPENCER. MARKS & SPENCER LOVELY BLUE SUMMER BEACH DRESS, SIZE 20. MARKS & SPENCER LOVELY BLUE SUMMER BEACH DRESS, SIZE 20. Listed as used, although never worn has been washed. Dispatched with Royal Mail 2nd Class. White Multi Floral. length from top of shoulder to hemline: 40". armpit to armpit: 22". been worn but still in good condition. A lovely quality lined dress, the outer a very floaty chiffon. Draped floaty cap sleeves, a v-neckline with a crossover and flattering empireline bust section. The dress has a side zip. The skirt widens into a flippy flowy style which hangs and moves beautifully. M&S Floral Summer Dress Size 10. Condition is Used. Dispatched with Royal Mail 2nd Class recorded. Green Lace Fabric. Twiggy @ M&S Dress size 16. Pit to Pit.21”. Length. 42”. Lined with Back Zip. Back Split. Marks and Spencer cream and black summer dress size 16 petite bust 38 ,hips 41 inches ,padded shoulders,pockets buttons all the way down the front Condition is Used. Dispatched with Royal Mail 2nd Class. Ladies Size 16 Marks & Spencers Summer Dress. Floaty short sleeves. Tie detail to the front. Floaty and cool for summer. Ivory base with pale red and blue flowers. Condition is Used. Dispatched with Royal Mail 2nd Class. From pet and smoke free home. Stretchy and soft. Soft thin elastic band around the waist to create a nice hourglass shape. Team it up with sandals or sneakers and long necklaces for a cool look (try a denim jacket on top as well!). M&S Purple & Black Floral Summer Dress Size 20 Scoop Neck with Short Sleeves. Fitted to waist and then flares out at the bottom. , feminine, and beautiful Marks & Spencer Autograph lined Dress size 14- Ideal for work, cruises, weddings, races, dinners, lunches Length approx. 53 inches - From a pet/smoke free home - please e-mail me if you have any questions. Fabulous M&S dress, blue floral floppy crepe fabric, short sleeves, ties at back of waist, keyhole and button at back of neck. Size in label UK 12 EUR 40. M&S collection dress in UK 10. Ditsy floral print with orange and pink as the main colours. Skater style with seam to accentuate the waist and small darts at the chest. Viscose material, feels a lot like light-weight jersey. Perfect for summer. Sadly, it is too small for me, so I'm selling it! Hardly used and in very good condition. I'm moving to Germany in 3 weeks so selling lots of nice things, it all has to go! Please have a look at my other items :) M&S Ditsy Floral Summer Dress - UK10. Condition is Used. Dispatched with eBay Shuttle - it's cheaper than Royal Mail now and includes tracking. Ladies printed shift dress from Marks. Lovely cream mix colour. Dress is in GOOD USED condition. Round neckline. Ideal for casual wear. Made in 100% Viscose. M&S ~ Pretty Summer Dress ~ Size 14 Fit 16 Too ~measures 21inches armpit to armpit ☆ . Condition is Used. Dispatched with Royal Mail 2nd Class. Tunic Dress Top. material: polyester. Grey/White Print. length from top of shoulder to hemline: 33". round neckline, 2 side splits. Stunning M&S COLLECTION Bodycon Ruched Dress size UK 14 Grey Yellow & White Floral Design Ruched Detail to the abdo / waist area making it very flattering Lined apart from the sleeves which also have Ruched Detail. Ideal for many Occasions - Weddings , parties , summer, events, holiday. Length 42 inches from top of shoulder to hem. Width 21 inches measured flat across the back from underarm to underarm ( one side only) Great Condition Inside label removed - see above measurements From smoke & pet free home Any questions - please ask Please see other items for sale as family are having a sort out. Condition is Used. Dispatched with Royal Mail 2nd Class. New marks & spencer soft jersey black multi maxi dress. black with a yellow blue blush pattern. Marks and Spencer Woman Ivory & Black Mix Fixed Wrap Dress size 12 Very Good Condition Material contains Elastane so stretchy. Very Versatile and Flattering Style. Length 42 inches Width 18 inches measured flat across the back from underarm to underarm ( one side only) Please see all photos From smoke & pet free home Any questions - please ask Please see other items for sale as my large family are having a sort out . Condition is used. Dispatched with Royal Mail 2nd Class. 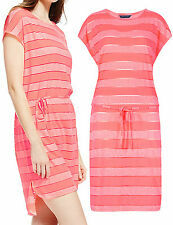 Ladies striped dress from Autograph @ Marks. Lovely navy blue mix colour. Dress is in GOOD USED condition. Made in 67% Viscose, 28% Polyamide, 5% Elastane. Ideal for casual wear. A lovely quality dress in a soft viscose jersey fabric with stretch. A fitted upper with the shrug effect incorporates the back neckline and sleeves. The skirt widens into a flowy style hangs beautifully. M&S indigo 2 in 1 dress size 8. Lace/Crochet Top, dipped hem floral skirt.